Hausergate: When did Hauser start making it up? By all accounts Marc Hauser has been falsifying data at least since 1995. He joined Harvard in 1992 and the first known data falsification was in 1995, so Harvard colleagues and associates could not have been unaware of his creative use of data. All the journals which published his papers since 1995 and all his peers and reviewers must also have been aware of his fertile imagination. It could just be gullibility or it could be incompetence but they can have few other excuses. But when did his creativity start? All his work must now be suspect. From his PhD in 1987 from UCLA, and through to his post-doctoral “work” at Ann Arbor, Michigan, at the University of California, Davis and at Rockefeller University, and all his production at Harvard, the presumption must be of exaggerations (which is probably how it started) and falsification. The magnitude of his fraud must encompass at least his salary and grants ever since he joined Harvard. 25 years on and toxicity is still being exported…. 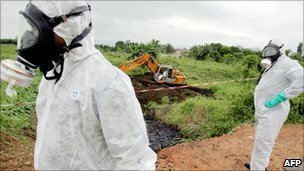 25 years after Bhopal where the manufacture of toxic products was “exported” to India the same “export” philosophy – this time with toxic wastes to the Ivory Coast – continues. I thought I could see signs of ethics returning to the corporate world but I was being too optimistic. “Business as usual and pay a few fines if you get caught” seems to apply. Nobody goes to jail after all. A Dutch court has found multinational Trafigura guilty of illegally exporting toxic waste from Amsterdam and concealing the nature of the cargo. In 2006, Trafigura transported waste alleged to have been involved in the injury of thousands of people in Ivory Coast. The firm was fined 1m euros (£836,894) for its ship, the Probo Koala, transiting Amsterdam with its cargo.Trafigura, an oil trading company, initially tried to clean up low-grade oil by tipping caustic soda into the hold of the Probo Koala. The company tried to unload the waste in Amsterdam for treatment, declaring it as “harmless slops”. Trafigura denies responsibility for the dumping of the waste and any deaths or injuries caused !! Posted in Environment, Ethics, Technology | Comments Off on 25 years on and toxicity is still being exported…. Cartels and Hypocrisy. But what happened to ethics? Firms and private cartels get fined but when OPEC countries fix prices it’s OK and when the International Diamond Cartel operates it is found to be beneficial!!! But ethics don’t get a mention. Seventeen bathroom equipment makers have been fined a total of 622m euros ($760; £510m) by the European Commission for price-fixing. The companies, including Ideal Standard of the US, which was fined 326m euros, formed a cartel for 12 years covering ceramics such as sinks, baths and taps. The fines of five companies were reduced to a level they could afford. The Commission described the firms’ practices as “very serious infringements of the EU competition rules”. However, it said its objective was not to force companies in difficulties out of business, and so reduced the fines on five companies. One, Masco of Italy, received full immunity as it was the first to provide information on the cartel. Public cartels were also permitted in the United States during the Great Depression in the 1930s and continued to exist for some time after World War II in industries such as coal mining and oil production. Cartels have also played an extensive role in the German economy during the inter-war period. International commodity agreements covering products such as coffee, sugar, tin and more recently oil (OPEC) are examples of international cartels with publicly entailed agreements between different national governments. Posted in Business, Philosophy | Comments Off on Cartels and Hypocrisy. But what happened to ethics?